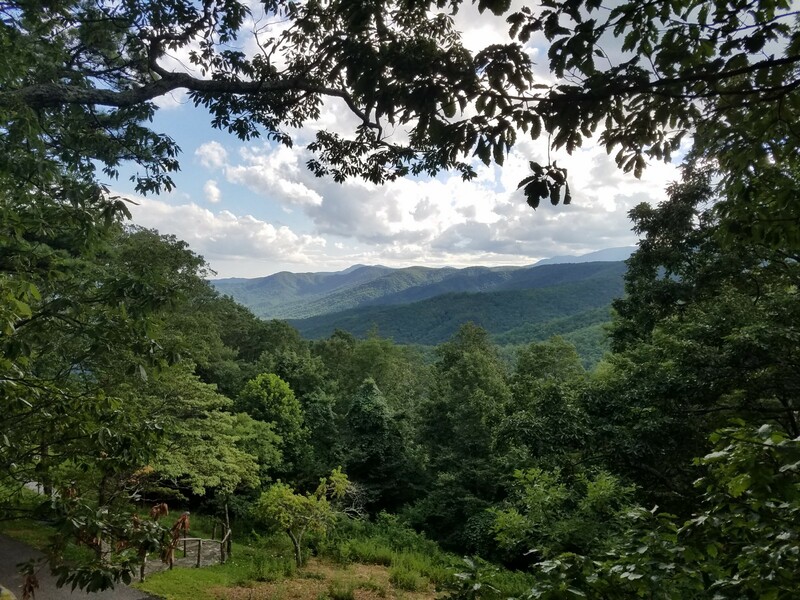 There are tons of artists in this section of North Carolina; many are drawn by a class, residency, or retreat and never leave. I can easily see how that would happen. This area feels a little magical and supportive of the arts in general. Here’s a rundown of my Wildacres residency experience. The grounds at Wildacres are beautiful. 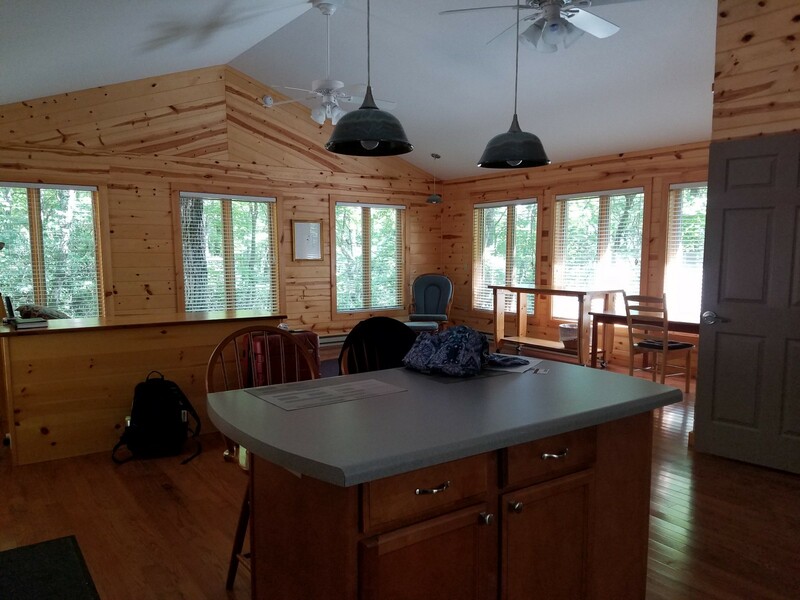 Laurel Cabin is quiet, peaceful, and has the perfect amount of space for one person. I spend my first couple of hours unpacking and settling in. There’s a journal in the cabin where past residents have left messages, and I read through them until dinner. I head to dinner on the Azalea Trail and quickly regret my poor choice in footwear — it’s a steep walk! At dinner, I meet various members of the staff as well as the two other residents who will be here for the week: Dan (staying at Owl’s Nest) and Melissa (staying in the Azalea Cabin). Melissa is working on a memoir about her daughter who passed away, an obviously emotional and difficult subject to write about. She shares that she’s also an acupuncturist who studies wild edibles. Dan works at the Library of Congress and is starting a creative nonfiction project that weaves his personal story of growing up in an evangelical family of missionaries with his study of medieval/Renaissance literature. We chat over dinner, and then I head back to Laurel Cabin. My first night, I assume I’ll have hard time falling asleep, but I open all of the windows and have an incredibly restful night. My first work day. My goal is to edit four of my final eight chapters, which are very rough. I manage two in the morning before I head to the lodge for lunch. After lunch, Dan gives me a ride into a nearby town, Spruce Pine, so I can pick up supplies. I stock up on food for breakfasts and lunches in my cabin, as well as the one thing I cannot reasonably write without: coffee. 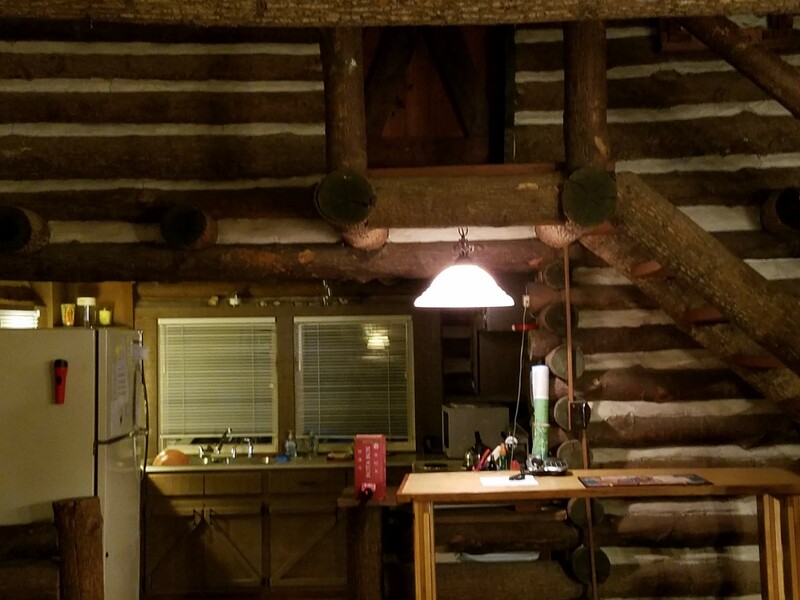 Now that I have coffee and food, I settle into my routine of working in the mornings and afternoons until dinner, when I head to the lodge to eat. I continue working that night and finish editing two more chapters for a total of four today. The insects are incredibly loud and mechanical sounding. It makes me feel like I’m sleeping in a washing machine at night. Sounds like a washing machine, right? I struggle with a really rough section in the morning and end up combining two chapters. This section is so difficult, I give myself a headache and head back to bed for a nap after a few hours of work. When I wake up, I dive in again and edit a total four chapters for the day (making it eight total). Just one left to go, but it’s going to be a completely new draft for a final chapter I realize the book has been missing all along. A storm rolls in around nine in the evening, and the rain sounds wonderful on the metal roof. Something I realize today: The lack of internet and all other distractions helps me fight my way through tricky chapters and plot problems. Work that would have taken me weeks at home, I push through in days. The silence and time allow me to go deeper into the writing. I wake up to the sound of crunching leaves. My cabin sits near a trail, so I assume someone is out hiking. But the steps don’t go away; instead, it sounds like they’re circling. Thinking someone might be lost, I go to my window. 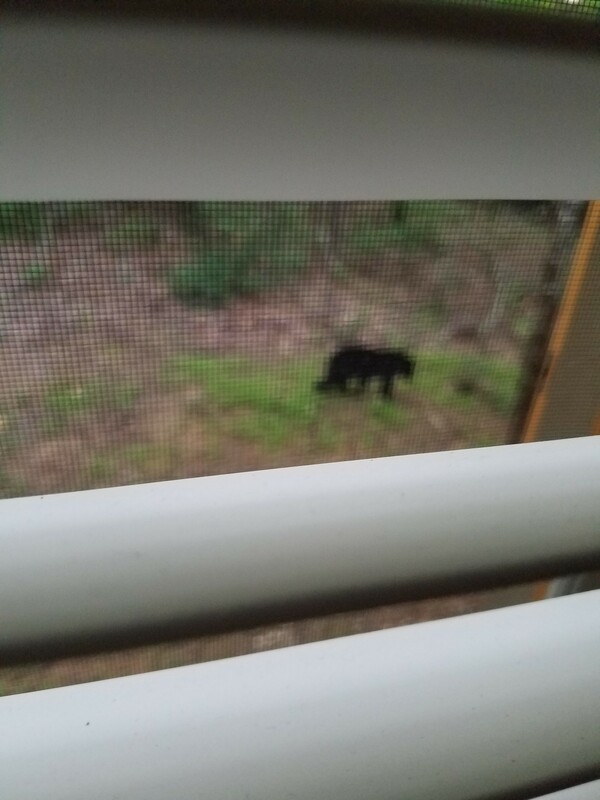 But instead of a hiker, I see a black bear. He’s about ten feet away. I get a horrible, grainy picture through my screen, and I worry that if I lift up the blinds, the noise might startle him (her?) away. He turns to the window and sniffs, as though he’s picked up my scent. He wanders away, and now I’m awake! No caffeine needed. After the bear leaves, I write the final chapter of my novel. I take all day to draft it, and I feel so good when I head to dinner, like I’ve already accomplished a tremendous amount during my residency. After the excitement of the bear in the morning, I have a hard time sleeping that night, startling awake at every sound. I’m missing my family like crazy, especially when I hear that my youngest has been crying a lot more than usual. I feel the typical mom guilt about not being there, but I’m states away so there’s not much I can do about it. At the same time, I feel great about how much work I’m getting done. This is the mom conundrum in a nutshell. During a call home, my husband tells me he’s decided to take the kids to see his mother in Dallas. We lost my father-in-law a little over a week ago, right before I left for North Carolina. Our pet sitter is traveling, so my husband plans to take our two kids, our 95-pound dog, and a new kitten on the road trip. More guilt for not being there during this horribly sad time, but I am not-so-secretly relieved I’m not managing the traveling zoo. But I admire how my husband is rolling with all of the punches. 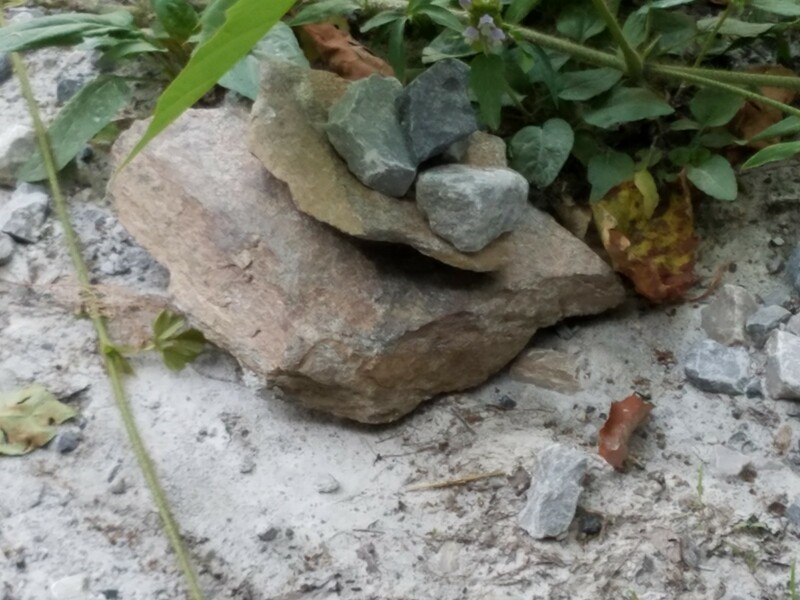 I stack a rock at this spot each day after dinner in memory of my father-in-law John. After the call, I work on arcs for all of my characters to make sure something clear and definitive happens to each of them during the course of the story. I hear leaves crunching and when I investigate, I spot a wild turkey behind the cabin. I work for hours, making edits and barely noticing a loud storm, until … there’s one thunderclap that is so loud it literally makes me jump out of my seat. I find out later that lightning hit near the lodge and WiFi and phone service will be down there for the next couple of days as a result (there is no WiFi, cell service, or cable in the cabins). I spend the rest of the day reading through the 72 or so pages I’ve worked on since I’ve been at Wildacres. When I read the climactic chapter, I cry, which I take as a good sign. I’m so involved in my work that I don’t make it to the lodge until about half an hour after dinner has already started. After dinner, Dan shows us what appears to be a dusty bear paw print on his car trunk. This does not make me feel better about sleeping in a cabin in the woods. Then Dan and Melissa come over to my cabin for wine, and we chat more about our projects and progress. We’re all getting a ton of work done. We discuss how we’re all introverts, but we’ve noticed that when we come together at night we’re chattering like magpies because we’ve spent most of the day alone. I work all morning and afternoon at my cabin. I’m starting my “final read,” reading my novel from start to finish. I want to get through the first 140 or so pages today, and I make my goal. In Spruce Pine, we run into Dan, who has spent the afternoon at Penland and tells us we have to visit. The three of us try to eat at the Knife and Fork, but they’re completely booked. (Note: Make sure you have reservations!) We head upstairs to the bar, the Spoon, and eat from their menu instead. We also listen to a great band. I love the lead singer’s guitar. His arm and hand have worn away the wood’s stain over what is clearly years of playing. All around me, there is evidence of people pursuing their art without the definitive markers that most Americans judge as “success.” Maybe not a lot of material gain or fame, but a deep attempt at mastery. We head over to Dan’s cabin to hang out after dinner because he’s leaving early tomorrow. Owl’s Nest is the original log cabin at Wildacres (Laurel and Azalea are newer), and we marvel over the hearth and other details. We enjoy more conversation, wine, and watermelon — all perfect on a summer night! That night, as I’m falling asleep, I notice a lightning bug in the corner of my cabin. It flickers on and off like a beacon leading me to my dreams. I read about 40 of 140 pages (my daily goal) in the morning. Melissa and I decide to check out Penland. I can’t write about that visit here, or this post will swell to twice as long as it is now. What I will say is that it’s an amazing, magical place (not unlike Wildacres) and you should go if you’re in the area. 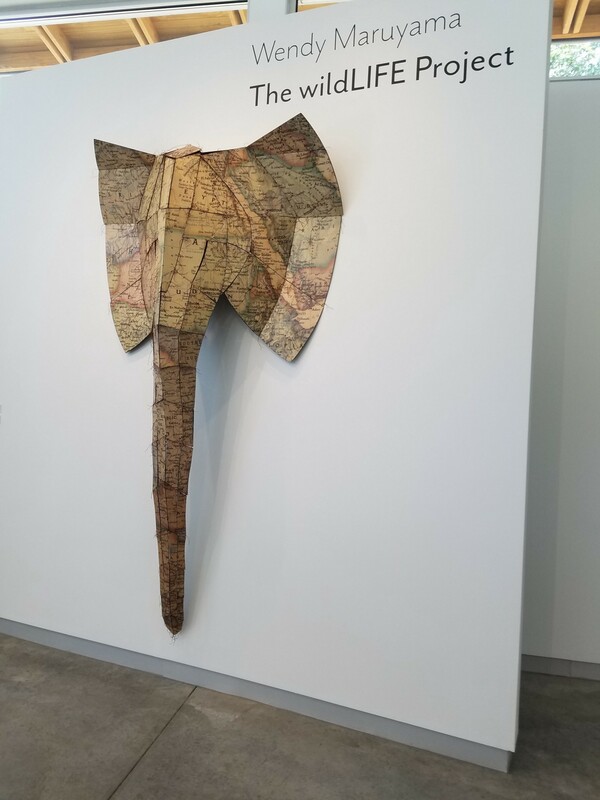 One of the exhibits at Penland. I buy some pottery at Barking Spider Pottery and Mica Gallery (about a 15-minute drive away). And then I say goodbye to Melissa, who is leaving very early the next morning. I loved visiting Penland, but it put me a little behind on my 140-page goal for the day. I stay up until 2 a.m., but only get to about 80 pages total. I need to read 200-plus pages today, so I get to work as soon as I wake up. I spot another wild turkey and notice the spiders in my cabin are growing bolder. They seem to actively rush me now. I work all day and head to dinner. I meet the three new residents. Tricia is in Owl’s Nest and Sherry and Nancy (two sisters who are collaborating on a project) are in Azalea. I feel rude, but I rush through dinner to return to my cabin to work (it is their first dinner, after all). I stay up until 2 a.m. again, and I finish reading the entire novel and make a ton of notes and edits. I’m back on track. I am leaving my residency a little early, Friday instead of the typical Sunday or Monday departure, due to a previously scheduled family vacation. The pressure is on. I decide to tackle edits. I need to get through 214 or so pages today. I work hard all day and hear Sherry (a composer) practicing her violin. It’s a lovely accompaniment to my work. I chat a little longer with the new residents at dinner. We discover we share a Texas connection. Nancy and Sherry grew up in Texas, Nancy still lives there, and Tricia writes a mystery series set in West Texas. After this chat, I also realize that every resident I talked to over my two weeks here (except Nancy, who had been to Wildacres before) was inspired to apply by this post. It’s my hope that my post will inspire others to apply to Wildacres too. After dinner, I watch a pottery demo and tour the clay studio. I try to soak up as much of the atmosphere as I can. I’m leaving so soon! Then I explore the Crescendo Trail and Amy Blumenthal’s garden. It’s a terraced garden and clearly a tremendous amount of work has gone into it. 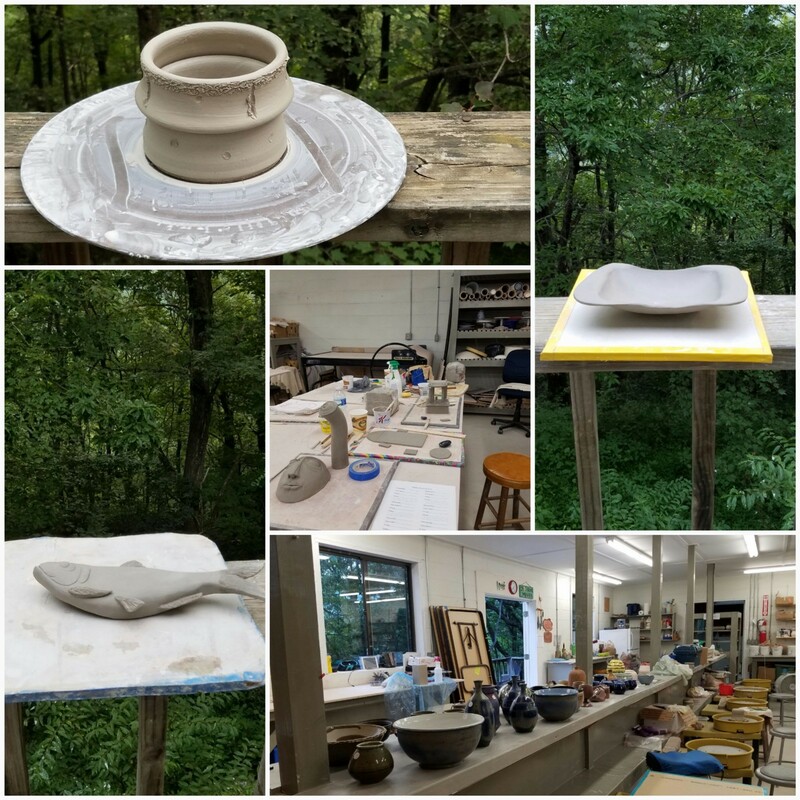 The pottery studio and works in progress. I stay up until 3 a.m. or so to meet my goal. I reach the halfway point on entering edits. I work like a fiend and enter all of my changes — my revision is done! At dinner, I enjoy a nice conversation with the other residents, and then come back to the cabin and work some more. I take extra time on the mountain trail on my way to the lodge and on my walk back to the cabin. I’m starting to say goodbye. This has been such a peaceful, productive residency. My novel is too long, but that’s a problem for a different day. My last full day! I spend an hour or so writing down my experiences and advice, such as it is, in the cabin journal. I spend the rest of the morning and afternoon looking at the notes I’ve made over the past couple of years of working on this novel to make sure I’ve included everything I wanted to. This is my last pass until I get to Austin, where I’ll share my novel with a few writer friends as well as my teacher. That night I take a longer hike than usual on the Loop Trail and say thank you and goodbye to Wildacres. The staff is amazing. I feel incredibly well-cared for and very fortunate to have had this opportunity to work in such a calm and peaceful environment. Next time: Tips for applying to Wildacres (or any writing residency). Fiction writer, content wrangler, startup veteran.